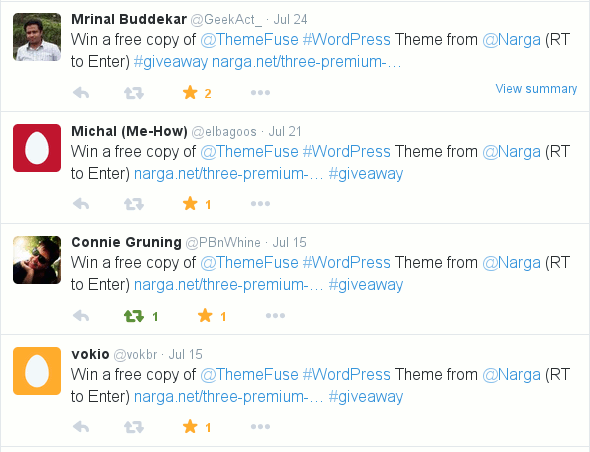 For two weeks running the ThemeFuse Themes Giveaway. We got 3 comments and 15 retweet with 4 twitter users. Before we proceed, We’d like to thank our sponsor ThemeFuse, for providing the three premium WordPress theme licenses and making this giveaway possible and everyone who participated. Post a comment here and tell us why you think you should be a winner and what you’ll do with your (free!) ThemeFuse theme if you’re chosen. and let the Twitterverse know about this awesome opportunity! Like the ThemeFuse Facebook page, and tell all of your friends to like it, too. To find the winners, we’re using Random.org to generate the set 3 numbers from 1 to 7, and here is the results. The twitter users are: Mrial Buddekar & Michal (Me-How). To the winners: I’ll be sending each of you an email / direct messages on winning. Please reply me with your contact details so that I can get the gift to you. To those who didn’t win: don’t give up! There will be more giveaways on NARGA in future, so do stay tuned, especially via your blog subscription, to be the first to know about latest posts, freebies, and giveaways! I have to thank you for prize I win. Nice to know that you published information on how you select the winners, because not everyone is doing it. For a prize I chose Envision Theme mostly for knowledge usage. I have got also 3 another themes from ThemeFuse in my WordPress content library so there is some possibilities to combining something new. Thanks NARGA.NET, I got the first Premium theme from ThemeFuse.